More than 90% of American hospitals have been computerized over the past decade. The goal has been to simplify physician tasks and free up time for patient care. That said, physicians spend approximately two hours doing computer work for every hour spent face-to-face with a patient. If this is the case, would it be a stretch to say that the wave of computerization has made life more difficult for physicians rather than easier? And if that is the case, what can be done to maximize the benefits of technology in healthcare without making life harder for staff and potentially sacrificing the quality of patient care? Partners HealthCare is one example of a healthcare company turning to computerization to make life easier for physicians – but is this really the case? The ultimate goal of computerization is to give doctors and nurses more insight into their patients more quickly. Partners HealthCare rolled out a new EHR at hospitals including Boston’s Brigham and Women’s Hospital in the last few years to do just that – its new software system tracks every patient’s vital healthcare information. However, many nurses and doctors ultimately viewed the implementation as a disruption. Everything from prescribing medication to ordering tests took longer as doctors navigated the new Epic system. In addition, it turned out – surprisingly – that there was such thing as too much information: the EHR reported so much data that thousands of monitors needed to be replaced with larger screens to fit all of it. In between collecting and sifting through all of that information, doctors and nurses feel they have less time to focus on the most important part of their job: patient care. One complement to computerization that more healthcare companies are considering is artificial intelligence, or AI. For example, AI would allow computers, rather than actual humans, to detect complex diagnoses in dozens of medical images – the time savings would ultimately yield cost savings, and potentially take the pressure off of nurses and doctors. But as it goes with any modernization effort, there are pitfalls still associated with AI that are keeping it from becoming mainstream. The biggest challenge has to do with datasets – without accurate data at the outset, AI cannot definitively make accurate diagnoses. It’s important for providers to have governed and trusted data to form the base of any decision-making. Even so, Tom Oates, a nephrologist in the UK, still tells CNBC that AI may one day be able to help him accomplish some of the more mundane tasks he has to do around the office. Certain existing algorithms can already help doctors with decision-making today. Although its usage is limited, AI is an example of the way technology can make life easier for healthcare providers now and in the future. Computerization may be a hurdle for healthcare professionals, but mobile is filling the gap. A study on healthcare professionals using mobile devices found that 87% of doctors were already using a smartphone or tablet device in the workplace. While this was compared to 99% who were already using a computer, it’s worth noting that many healthcare workers were turning to mobile devices to achieve similar tasks – things like communicating, accessing diagnosis aids, or using medical calculators. Doctors and nurses have traditionally relied on Computers on Wheels (COWs) or Workstations on Wheels (WOWs) to get work done. Mobile devices now untether healthcare professionals from these workstations and give them a way to access everything from patient information to medication documents on the go. This ultimately frees up time and improves productivity. 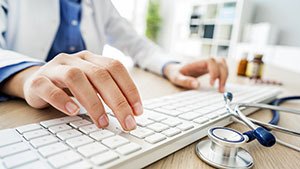 Healthcare providers, such as Partners HealthCare, are often more than willing to train doctors and nurses and give them the additional technology they need to adjust to computerization in the workplace. There is also an abundance of resources, such as training guides and online courses, that are designed to give medical professionals insight into how to best use computers in a healthcare environment. Does this mean that there won’t be pitfalls in the along the way? Ultimately, there is no guarantee, but the story of technology’s growing role in healthcare is one that continues to be written. Krystle Vermes is a professional writer and blogger with a background in both online and print journalism. Her passions include everything from technology to healthcare. Krystle is a graduate of Suffolk University.